StraubTM pipe couplings have helped provide innovative and cost-effective solutions to a number of diverse challenges in industry, shipbuilding, and water and waste water management and infrastructure. See below for some information in brief on how this was achieved. An external pneumatic post system links the production plant and central laboratories of Lonza AG in Visp. At the Lonza chemical and biotechnology plant in Visp, the existing external pneumatic post system is central to the production and quality assurance processes. Weather-related ageing made it necessary to renew the original pipe couplings. The replacements are specially modified STRAUB-REP 1L pipe couplings, ensuring reliable connection and continuous availability of the pneumatic post system. Click on the pdf below to see how Straub could offer a tailored solution to the challenges of this renewal project. Extreme deformation and a big gap between the pipe ends. Since 2001, Singapore, a city spreading over 650 km2, has been planning and constructing a new centralised waste water treatment facility. Connection problems arose when it came to joining the over 3-metre diameter sewerage tunnels into the distribution system. Due to construction tolerances, the axes had been shifted by up to 45 mm, and the ends of the pipes had been deformed by initial efforts to connect them up. To ensure that the construction schedule was not put in jeopardy, it was necessary to quickly find a new connection solution. 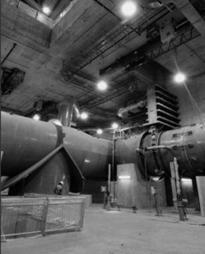 Four 3.6 m diameter couplings were installed. The axial offset and deformation were compensated by the application of plastic coatings on the pipe ends. By matching the outer diameters, it was possible to permanently connect the pipes with specially manufactured, plastic-coated STRAUB-OPEN-FLEX pipe couplings. Click on the pdf below to see how Straub could offer a tailored solution to the challenges of this construction project. STRAUBTM pipe couplings comply with current IACS regulations. Cost-efficiency in the tightest of spaces. Any number of uses, and highly cost-efficient at the same time: that is why shipbuilders and drilling platforms use StraubTM pipe couplings. Shipbuilders in particular repeatedly face the challenge of laying a great many pipes through narrow, hard-to-reach spaces, while cutting back on costs. Circumstances like that demand the most of a pipe coupling system. There are many benefits to using StraubTM pipe couplings in such a situation. StraubTM pipe couplings are approved for virtually all pipe systems, because regardless of diameter and what they are made of – they are suitable for use with all the materials used in shipbuilding and on drilling platforms. Joints having high elasticity, rather than a rigid grip, largely eliminate the stresses and tensions from piping systems assembled with StraubTM couplings. And that considerably prolongs their service life. Click on the pdf below to see how StraubTM pipe couplings offer a solution to the challenges of confined spaces. An advanced coupling solution for controlled drainage. Flow retarders, using a flexible hydrostatic butterfly-valve system in the main sewer, have proved to be the most reliable and economic solution to preventing flooding in Feldkirch in periods of extreme rainfall. StraubTM expertise guided the project from the planning stage right through to connection of the concrete chambers into the sewer network, including provision of comprehensive documentation. The highly efficient Straub-Flex 3LS pipe coupling reduced the installation time for a single flow retarder to less than one hour. In recent years, many regions of the world – including the Alpine countries – have suffered from unpredictable weather patterns. Nestling in the Austrian Alps, Feldkirch has repeatedly had to struggle with the problem of the inability of downstream levels of the sewer system to cope with the excessive volumes of storm water. Flooded streets, cellars and basements in the surrounding residential areas have been the costly and unpleasant consequence. Feldkirch city engineers were faced with a choice: either to construct additional, high capacity storm-water reservoirs or to expand the at-risk areas of the sewer system to ensure that even extreme rainfall would not overload them. 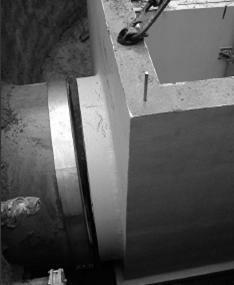 Following extensive investigation and costing studies, the decision was taken to install flow retarders, linked into the main sewer by means of Straub pipe couplings. In situations of threatening flooding, the flow retarders are able to control the flow of flood water upstream of the critical areas of the sewer system. In comparison with the stormwater reservoir alternative, this elegant and safe solution has saved the city of Feldkirch more than EUR 4 million. 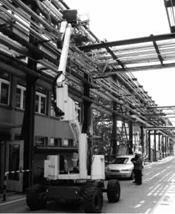 A total of five flow retarders were installed in the Gisingen district of Feldkirch. Three of these are rigid flow retarders; they were installed in sections of the sewer system with pipe diameters of 1690 or 2400 mm. The two larger ones, which this article focuses on, are equipped with a flexible hydrostatic butterfly valve system, and are linked into the sewer network by means of 2400 mm joint spigots. Click on the pdf below for a more detailed article on how Straub pipe couplings provided the ideal solution for this project.